Dan Verssen Games could have easily rested on its laurels and moved on to creating other games. 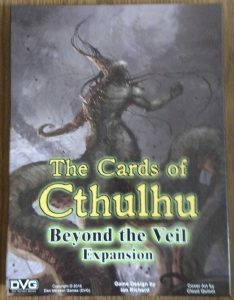 Thankfully they went the extra mile and created The Cards Of Cthulhu: Beyond The Veil Expansion. 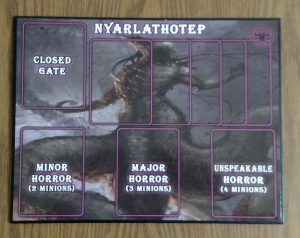 This expansion introduces Nyarlathotep to the game, along with some new Horrors to aid the infamous Outer God. Thankfully, it also include some new followers and Investigator cards (along with plenty of items) in order to give anyone who plays a fighting chance! The silver color does help set them apart from the copper tokens from The Cards Of Cthulhu, although I personally think the patina effect on those tokens looked better. Since The Cards Of Cthulhu: Beyond The Veil Expansion requires you to already own The Cards Of Cthulhu in order to play it, there are no extra dice included. You can certainly play this without using the cards from the original game, but you can also combine the decks if you want to. In fact, the expansion cards call have “Veil” printed on the bottom front of the cards in case you need to separate them from the regular cards. The instructions include the illustrated rules, sample game demonstrations and numerous new rules for both solitaire and multiplayer games to further enhance its replay value. I tried out the traditional and “novella” methods of solo play and had fun both ways. In fact, I racked up more wins playing this version than I did playing The Cards Of Cthulhu for my last review! Sadly, no short stories are included this time around. 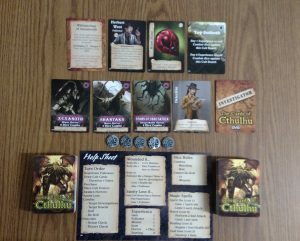 Dan Verssen Games has hit it out of the park once again with The Cards Of Cthulhu: Beyond The Veil Expansion. But that’s an admittedly minor quibble. Those upset that the expansion doesn’t include more tokens or extra dice will be happy to learn bonus packs containing those items are available separately (but aren’t required to play this).